Century old brick and wood steeped in American history, along with panoramic windows and a wrap around balcony make Bay 7 at American Tobacco District in Durham an unforgettable space. Minutes from DPAC, Durham Bulls Stadium and choice hotels. Take a walk through hallowed ground where one of the greatest American entrepreneurial stories took place. Bay 7 can accommodate from 70-400 people in 10,000 square feet of urban chic setting within a registered historic site, complete with exposed brick walls, hardwood floors and steel girders. Guests enjoy the delicious food and award-winning hospitality of The Angus Barn and Iron Chef America Winner Walter Royal. All inclusive wedding options from ceremony to reception with dining choices including station, plated, cocktail style service and a full range on in-house amenities with tables & decor, chairs, linen, china, hi-fi audio visual equipment, staging and service. 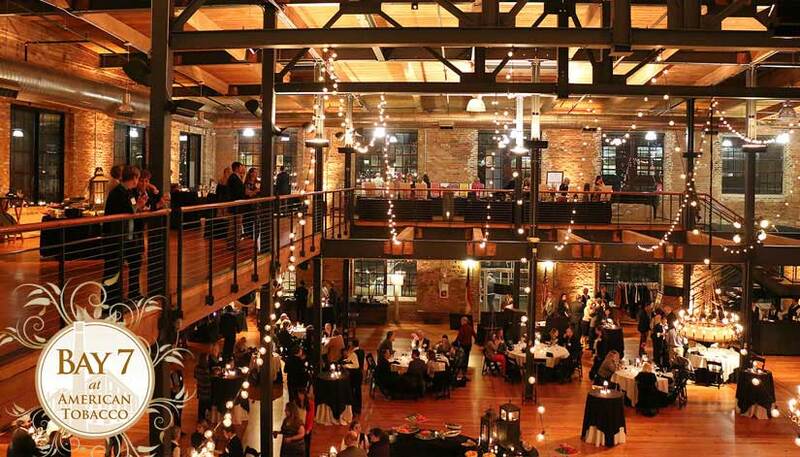 Bay 7 is also the perfect spot for holiday parties, corporate events, fund raisers or most any type of event. Call 919-278-2713 or fill out a information request below.